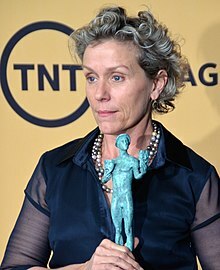 Frances Louise McDormand (born Cynthia Ann Smith, June 23, 1957) is an American actress. She is the recipient of numerous accolades, including two Academy Awards, two Primetime Emmy Awards, and a Tony Award, making her one of the few performers to achieve the Triple Crown of Acting. McDormand made her Broadway debut in a 1984 revival of the drama Awake and Sing!, and received a nomination for the Tony Award for Best Actress in a Play for her acclaimed performance as Stella Kowalski in a 1988 revival of A Streetcar Named Desire. She returned to Broadway in 2008 with a revival of The Country Girl, leading to a Drama Desk Award nomination for Outstanding Actress in a Play. In 2011, she won the Tony Award for Best Actress in a Play for playing a troubled single mother in Good People. On television, McDormand played the titular protagonist in the HBO miniseries Olive Kitteridge (2014), which won her the Primetime Emmy Award for Outstanding Lead Actress. McDormand was born Cynthia Ann Smith in Gibson City, Illinois. She was adopted at one and a half years of age by Noreen (Nickelson) and Vernon McDormand and renamed Frances Louise McDormand. Her adoptive mother was a nurse and receptionist while her adoptive father was a Disciples of Christ pastor; both were originally from Canada. McDormand has said that her biological mother, to whom she proudly referred, along with herself, as "white trash," may have been one of the parishioners at Vernon's church. She has a sister, Dorothy A. "Dot" McDormand, who is an ordained Disciples of Christ minister and chaplain, as well as another sibling, both of whom were adopted by the McDormands, who had no biological children. Because her father specialized in restoring congregations, he frequently moved their family, and they lived in several small towns in Illinois, Georgia, Kentucky, and Tennessee, before settling in Monessen, Pennsylvania, where McDormand graduated from Monessen High School in 1975. She attended Bethany College in West Virginia, earning a Bachelor of Arts degree in theater in 1979. In 1982, she earned a Master of Fine Arts degree from the Yale School of Drama. She was a roommate of actress Holly Hunter while living in New York City. McDormand's first professional acting job was in Derek Walcott's play In a Fine Castle also known as The Last Carnival, which was funded by the MacArthur Foundation and performed in Trinidad. In 1984 she made her film debut in Blood Simple, the first film by the Coen brothers. In 1987, she appeared as the wacky friend Dot in Raising Arizona, starring Holly Hunter and Nicolas Cage. In addition to her early film roles, McDormand played Connie Chapman in the fifth season of the television police drama Hill Street Blues. In 1988, she played Stella Kowalski in a stage production of Tennessee Williams' A Streetcar Named Desire, for which she was nominated for a Tony Award. McDormand is an associate member of the experimental theater company The Wooster Group. In 2002, "the game and talented" McDormand performed as Oenone in the Wooster Group's production of an "exhilarating dissection" of Racine's tragedy Phèdre entitled "To You, the Birdie!," at Ann's Warehouse in Brooklyn, New York. After appearing in several theatrical and television roles during the 1980s, McDormand gradually gained renown and critical acclaim for her dramatic work in film. In 1988, she was nominated for the Academy Award for Best Supporting Actress for Mississippi Burning. Cast alongside Gene Hackman and Willem Dafoe, McDormand was singled out for praise, with Sheila Benson, in her review for the Los Angeles Times, writing, "Hackman's mastery reaches a peak here, but McDormand soars right with him. And since she is the film's sole voice of morality, it's right that she is so memorable." In 1996, she won her first Academy Award for Best Actress for her performance as a pregnant police chief Marge Gunderson in Fargo, written and directed by the Coen brothers. Writing for the Chicago Sun-Times, Roger Ebert called Fargo "one of the best films I've ever seen" and felt that McDormand "should have a lock on an Academy Award nomination with this performance, which is true in every individual moment, and yet slyly, quietly, over the top in its cumulative effect." In 2000, she was nominated for the Academy Award for Best Supporting Actress and the Golden Globe Award for Best Supporting Actress in a Motion Picture for her portrayal of an overbearing mother in Almost Famous. For her role in Wonder Boys (2000), she won Best Supporting Actress from the Broadcast Film Critics Association, the Florida Film Critics Circle, and the Los Angeles Film Critics Association. In 2006, McDormand received her fourth nomination for the Academy Award for Best Supporting Actress for her performance in North Country (2005). The same year she won an Independent Spirit Award for her supporting role in Nicole Holofcener's dark comedy Friends with Money (2006). She also voiced the role of the principal Melanie Upfoot in the Simpsons episode "Girls Just Want to Have Sums", which aired on April 30, 2006. In 2008, McDormand starred in the films Burn After Reading and Miss Pettigrew Lives for a Day. She then appeared in the action movie Transformers: Dark of the Moon, playing the US government's National Intelligence Director, alongside her Burn After Reading co-star John Malkovich. She returned to the stage in the David Lindsay-Abaire play Good People, in a limited engagement on Broadway from February 8, 2011 to May 29, 2011. Her performance earned her the Tony Award for Best Actress in a Play. In the animated film Madagascar 3: Europe's Most Wanted (2012), she voiced Capitain Chantel Dubois and also sang a version of the French song "Non, je ne regrette rien". McDormand starred in Promised Land with Matt Damon, filmed in April 2012 and released on December 28, 2012. In November 2014, HBO telecast a four-part mini-series based upon the series of short stories by Elizabeth Strout, Olive Kitteridge, co-produced by and starring McDormand. The role won her the Primetime Emmy Award and Screen Actors Guild Award for Best Actress. With her Emmy win, McDormand became the 12th actress in history to achieve the "Triple Crown of Acting", for competitive Oscar, Emmy, and Tony Award wins in the acting categories. McDormand starred in the 2017 film Three Billboards Outside Ebbing, Missouri, for which she won her second Academy Award for Best Actress (her statuette was stolen briefly following the awards ceremony), the Golden Globe Award for Best Actress in a Motion Picture – Drama, and the Screen Actors Guild Award for Outstanding Performance by a Female Actor in a Leading Role. McDormand has been married to director Joel Coen since 1984, and they adopted a son from Paraguay, Pedro McDormand Coen, in 1995. They live in New York City and also own a residence in Bolinas, California. ^ a b c Grannan, Katy (October 3, 2017). "Frances McDormand's Difficult Women". The New York Times. Retrieved January 17, 2018. ^ "Naked ambition". The Age. Australia. ^ "Rev Vernon Weir McDormand (1922 - 2011)". www.findagrave.com. ^ a b "Naked ambition". The Age. Melbourne. October 25, 2003. Retrieved July 29, 2010. ^ "Disciples "PK" wins best actress' award. Disciples News Service Release. 31 March 2007". Disciples.org. Archived from the original on March 2, 2008. Retrieved July 29, 2010. ^ "I'd love to play a psycho killer. film.guardian.co.uk. 26 January 2001". The Guardian. London. February 14, 2001. Retrieved July 29, 2010. ^ Ben Brantley (2002). "Theater Review: Racine's Pale Queen, Struggling With Racket Sports". The New York Times. February 19, 2002. ^ "Story Medium". Imagine Fashion. Interview with Frances McDormand (2011). ^ Benson, Sheila (December 18, 1988). "RCritic's Notebook: Some 'Burning' Questions". Los Angeles Times. Los Angeles Times. Retrieved April 30, 2016. ^ Cameron Crowe, Frances McDormand interview, Interview Magazine, October 2000. ^ Ebert, Roger (March 8, 1996). "Fargo". RogerEbert.com. Ebert Digital LLC. Retrieved March 20, 2018. ^ ""Little Miss Sunshine" pulls up to take the crown at 2007 Film Independent's Spirit Awards". Film Independent Spirit Awards. February 24, 2007. Archived from the original on February 27, 2007. Retrieved August 8, 2015. ^ Bruni, Frank (October 15, 2014). "Frances McDormand, True to Herself in HBO's Olive Kitteridge". The New York Times. ^ Melas, Chloe (March 5, 2018). "Frances McDormand's Oscar stolen (and returned)". CNN Entertainment. Turner Broadcasting System, Inc. Retrieved March 5, 2018. ^ Grobar, Matt (January 7, 2018). "'Three Billboards' Star Frances McDormand Expresses Gratitude For Tectonic Shift In Entertainment Industry". Deadline. Retrieved January 7, 2018. ^ Durbin, Karen (March 2, 2003). "The Prime Of Frances McDormand". The New York Times. Retrieved July 21, 2017. ^ "Going coastal / Is the elusive bohemian enclave of Bolinas getting a bit glossier?". Retrieved March 5, 2018. ^ Bruni, Frank (October 15, 2014). "A Star Who Has No Time for Vanity". The New York Times. Retrieved July 21, 2017. Wikimedia Commons has media related to Frances McDormand.